RuPaul’s Drag Race, The Assassination of Gianni Versace, and other inclusive shows brought home awards at the 70th Annual Emmy Awards. 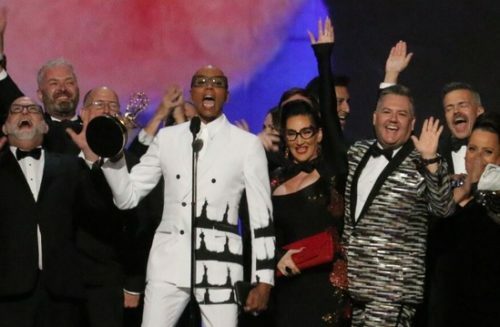 RuPaul’s Drag Race took home the Emmy for Outstanding Reality Competition Program for the first time in the show’s history. The show won four other Emmys at last week’s Creative Arts Emmys, including Outstanding Costumes For Variety, Outstanding Directing For A Reality Program, Outstanding Host For A Reality Or Reality-Competition Program (for RuPaul), and Outstanding Hairstyling For A Multi-Camera Series Or Special. The Assassination of Gianni Versace: American Crime Story also took home the award for Outstanding Limited Series. Ryan Murphy also won the Emmy for Directing for a Limited Series for his work on Gianni Versace, which he dedicated to LGBTQ hate crime victims. “One out of every four LGBTQ people in this country will be a victim of a hate crime. We dedicate this award to them,” he said. Outstanding Lead Actor in a Limited Series or TV Movie went to Darren Criss’s portrayal of Andrew Cunanan in Gianni Versace. Merritt Wever won the Emmy for Outstanding Supporting Actress in the role of Mary Agnes McNue on Godless. Her character is in a relationship with another woman.